HomeRampant carbapenem-resistant Klebsiella BSIs: a window to a post-antibiotic apocalypse? Rampant carbapenem-resistant Klebsiella BSIs: a window to a post-antibiotic apocalypse? 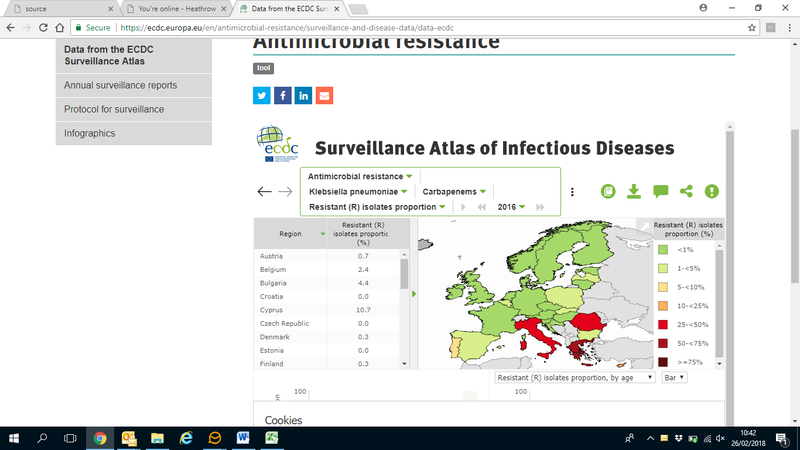 Whilst the issues with AMR are undoubtedly getting worse, there is some evidence that we can reverse AMR trends with concerted efforts. For example, the English MRSA and C. difficile ‘miracles’ give us hope. Some have even gone so far as to say that the antibiotic apocalypse is so slow moving that it will stop long before a doomsday scenario (see Drew Smith blog here). But this study just published from Greece suggests that it’s already here, at least in some parts of the world. 45% of patients became colonised with CPE. Yep, almost half. The median time to colonisation was just 8 days. 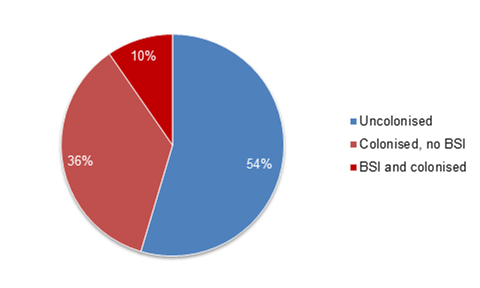 Even worse, 10% of the total number of patients (which is 27% of those who became colonised) developed a BSI. Even worse still, the median time from colonisation to BSI was a remarkably short 4 days. KPC in ST298 pneumoniae accounted for all CPE in the isolates tested (the matching isolates from the rectal screen and BSI from the 48 patients with BSIs). Figure 1: Colonisation and infection rate, among 498 patients. What on earth is happening on this unit to drive these awful patient outcomes? Do they have an infection control programme in place? Do they give out meropenem like Smarties? Or is this typical of all Greek ICUs? (Remember, that in the latest EARS-Net data, >75% of invasive Klebsiella pneumoniae infections were resistant to carbapenems – to the extent that the good folk at EARS-Net needed to pen a new colour for the chart!! – see Figure 2). Figure 2: Geographical variation in invasive Klebsiella pneumoniae isolates resistant to carbapenems, 2017. Risk factors for CPE colonisation in multivariable analysis were ‘extended’ length of ICU stay (i.e. more than a few days! ), high patient:nurse ratio, and exposure to antimicrobials that disturb the anaerobic flora. These same factors were associated with CPE BSI in univarable (but not multivariable) analysis. Unhelpfully, no odds ratios are provided, so it’s difficult to determine the relative importance of these associations. Also, I’d be interested to see how / whether the authors tested for multiple co-linearity amongst these independent variable, especially because they tested quite a few different antibiotic-related variables. Still, the finding that patient:nurse ratio drove CPE colonisation (and probably infection too) suggests that patient-to-patient transmission is one of the key drivers here. The remarkable clonal relatedness of the CPE that was typed supports that patient-to-patient transmission of CPE was rife on the unit. There are a few important unknowns in this study. What were the outcomes of patients with / without a BSI? (Other studies suggest that this would make grim reading.) What was the overall rate of BSI on the unit? If 10% of admissions had a BSI with CPE, how many of the patients had a BSI with other organisms? And how many of the patients with CPE colonisation but not BSI had a CPE infection at another site? Why did 1 in 5 colonisations end in a BSI? To what extent was this due to the high rate of carbapenem-resistance (and resistance to other antibiotics) in these isolates? Unanswered questions aside, this study gives pause for thought, to say the least. The findings are alarming, and largely unexplained. The concern is that these findings are typical of critical care across Greece. If this is the case, it’s difficult to see a way back to gaining control over CPE, especially given the issues with the economy and wider healthcare system in Greece in recent years. But perhaps these findings give us the impetus and evidence that we need to prompt local, regional, national, and international action to tackle AMR…before it’s too late.